Syriac Christianity (Syriac: ܡܫܝܚܝܘܬܐ ܣܘܪܝܝܬܐ‎ / Mšiḥāyuṯā Suryāyṯā) is the form of Eastern Christianity whose formative theological writings and traditional liturgy are expressed in the Syriac language. The Syriac language is a variety of Middle Aramaic that in an early form emerged in Edessa, Upper Mesopotamia in the first century AD. It is closely related to the Jewish Palestinian Aramaic spoken by Jesus. This relationship added to its prestige for Christians. The form of the language in use in Edessa predominated Christian writings and was accepted as the standard form, "a convenient vehicle for the spread of Christianity wherever there was a substrate of spoken Aramaic". The area where Syriac or Aramaic was spoken, an area of contact and conflict between the Roman Empire and the Sasanian Empire, extended from around Antioch in the west to Seleucia-Ctesiphon, the Sasanian capital, in the east and comprised the whole or parts of present-day Lebanon, Palestine/Israel, Syria, Turkey, Iraq and Iran. Christianity began in the Middle East in Jerusalem among Aramaic-speaking Jews. It soon spread to other Aramaic-speaking Semitic peoples along the Mediterranean coast and also to the inland parts of the Roman Empire and beyond that into the Parthian Empire and the later Sasanian Empire, including Mesopotamia, which was dominated at different times and to varying extents by these empires. The ruins of the Dura-Europos church, dating from the first half of the 3rd century are concrete evidence of the presence of organized Christian communities in the Aramaic-speaking area, far from Jerusalem and the Mediterranean coast, and there are traditions of the preaching of Christianity in the region as early as the time of the Apostles. However, "virtually every aspect of Syriac Christianity prior to the fourth century remains obscure, and it is only then that one can feel oneself on firmer ground." The fourth century is marked by the many writings in Syriac of Saint Ephrem the Syrian, the Demonstrations of the slightly older Aphrahat and the anonymous ascetical Book of Steps. Ephrem lived in the Roman Empire, close to the border with the Sasanian Empire, to which the other two writers belonged. Other items of early literature of Syriac Christianity are the Diatessaron of Tatian, the Curetonian Gospels and the Syriac Sinaiticus, the Peshitta Bible and the Doctrine of Addai. The bishops who took part in the First Council of Nicea (325), the first of the ecumenical councils, included twenty from Syria and one from Persia, outside the Roman Empire. Two councils held in the following century divided Syriac Christianity into two opposing parties. In 431, the Council of Ephesus, which is reckoned as the third ecumenical council, condemned Nestorius and Nestorianism. It was ignored by the East Syriac Church of the East, which had been established in the Sasanian Empire as a distinct Church at the Council of Seleucia-Ctesiphon in 410, and which at the Synod of Dadisho in 424 had declared the independence of its head, the Catholicos, in relation to "western" (Roman Empire) Church authorities. Even in its modern form of Assyrian Church of the East and Ancient Church of the East, it honours Nestorius as a teacher and saint. In 451, the Council of Chalcedon, the fourth ecumenical council, condemned Monophysitism. This council was rejected by the Oriental Orthodox Churches, one of which is the West Syriac Syriac Orthodox Church. The Patriarchate of Antioch was then divided between a Chalcedonian and a non-Chalcedonian communion. The Chalcedonians were often labelled 'Melkites' (Emperor's Party), while their opponents were labelled Monophysites (those who believe in the one rather than two natures of Christ) and Jacobites (after Jacob Baradaeus). The Maronite Church found itself caught between the two (allegedly embracing Monothelitism), but claims to have always remained faithful to the Catholic Church and in communion with the bishop of Rome, the Pope. The two Christological doctrines that were thus condemned are polar opposites. Both the West Syriac Church and the East Syriac maintained that their own doctrine was not heretical and accused the other of holding the opposing condemned doctrine. Their fifth-century estrangement still persists. In 1999 the Coptic Orthodox Church blocked admittance of the Assyrian Church of the East to the Middle East Council of Churches, which has among its members the Chaldean Catholic Church and some Protestant Churches,  and demanded that it remove from its liturgy the mention of Diodore, Theodore, and Nestorius, whom it venerates as "the Greek doctors". The liturgies of the East and West Syriacs are quite distinct. The East Syriac Rite is noted especially for its eucharistic Qurbana of Addai and Mari, in which the Words of Institution are absent. West Syriacs use the Syro-Antiochian or West Syriac Rite, which belongs to the family of liturgies known as the Antiochene Rite. Among the Saint Thomas Christians of India, the East Syriac Rite was the one originally used, but those who in the 17th century accepted union with the Syriac Orthodox Church adopted the rite of that church. A schism in 1552 in the Church of the East gave rise to a separate patriarchate, which at first entered into union with the Catholic Church but later formed the nucleus of the present-day Assyrian Church of the East and Ancient Church of the East, while at the end of the 18th century most followers of the earlier patriarchate chose union with Rome and, with some others, now form the Chaldean Catholic Church. In India, the majority of the Saint Thomas Christians, who initially depended on the Church of the East, maintained union with Rome in spite of discomforts felt at Latinizations by their Portuguese rulers and clergy, against which they protested. They now form the Syro-Malabar Catholic Church. A small group, which split from these in the early 19th century, united at the beginning of the 20th century, under the name of Chaldean Syrian Church, with the Assyrian Church of the East. In India, all the Saint Thomas Christians are collectively called Syrian Christians. Those who in 1553 broke with the Catholic Church as embodied in the Portuguese in India and soon chose union with the Syriac Orthodox Church later split into various groups. The first separation was that of the Malabar Independent Syrian Church in 1772. In 1889 the Mar Thoma Syrian Church, adopted an Anglican-inspired theology, broke away and in turn those within it who adopted a more pronounced Reformation attitude formed in 1961 the St. Thomas Evangelical Church. At the end of the 19th century and in the course of the 20th, a division arose among those who remained united with the Syriac Orthodox Church who insisted on full autocephaly and are now called the Malankara Orthodox Syrian Church and those, the Jacobite Syrian Christian Church, who remain faithful to the patriarch. A reunion movement led in 1930 to the establishment of full communion between some of the Malankara Syrian Orthodox and the Catholic Church. They now form the Syro-Malankara Catholic Church. In the Middle East, the newly enthroned patriarch of the Syriac Orthodox Church, Ignatius Michael III Jarweh, declared himself a Catholic and, having received confirmation from Rome in 1783, became the head of the Syriac Catholic Church. In the 19th and 20th centuries many Syriac Christians, both East ad West, left the Middle East for other lands, creating a substantial diaspora. Indigenous Aramaic speakers of Mesopotamia (Syriac: ܣܘܪܝܝܐ‎, Arabic: سُريان‎) adopted Christianity very early, perhaps already from the first century, and began to abandon their three-millennia-old traditional ancient Mesopotamian religion, although this religion did not fully die out until as late as the tenth century. [citation needed] The kingdom of Osroene with the city of Edessa was absorbed into the Roman Empire in 114 as a semiautonomous vassal state and then, after a period under the rule of the Parthian Empire, was incorporated as a simple Roman province in 214. In 431 the Council of Ephesus declared Nestorianism a heresy. Nestorians, persecuted in the Byzantine Empire, sought refuge in the parts of Mesopotamia that were part of the Sasanian Empire. This encouraged acceptance of Nestorian doctrine by the Persian Church of the East, which spread Christianity outside Persia, to India, China, Tibet and Mongolia, expanding the range of this eastern branch of Syriac Christianity. The western branch, the Jacobite Church, appeared after the Council of Chalcedon's condemnation of Monophysitism in 451. The Syriac Catholic Church, a West Syriac Rite Eastern Catholic church. The Maronite Church, a West Syriac Rite Eastern Catholic Church. The Syro-Malankara Catholic Church, a West Syriac Rite Eastern Catholic Church based in Kerala, India. The Malankara Marthoma Syrian Church. (Mar Thoma Church), an Eastern Oriental church based in Kerala, India. Mar Thoma church is in communion with the Anglican Church. The Malabar Independent Syrian Church (Thozhiyur church), an independent church based in Kerala, India. 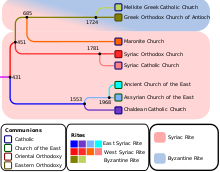 The Chaldean Catholic Church, an East Syriac Rite Eastern Catholic Church, emerged from the Church of the East following splits in 1552, 1667/1668 and 1779. East Syriac Christians were involved in the mission to India, and many of the present Churches in India are in communion with either East or West Syriac Churches. These Indian Christians are known as Saint Thomas Christians. In modern times, various Evangelical denominations sent representatives among the Syriac peoples. As a result, several Evangelical groups have been established, particularly the Assyrian Pentecostal Church (mostly in America, Iran, and Iraq) from East Syriac peoples, and the Aramean Free Church (mostly in Germany, Sweden, America and Syria) from West Syriac peoples. Because of their Protestant theology these are not normally classified as Eastern Churches or Syriac Christianity. ^ Cameron, Averil; Garnsey, Peter (1998). The Cambridge Ancient History. 13. p. 708. ISBN 9780521302005. ^ Allen C. Myers, ed (1987). "Aramaic". The Eerdmans Bible Dictionary. Grand Rapids, Michigan: William B. Eerdmans. p. 72. ISBN 0-8028-2402-1. "It is generally agreed that Aramaic was the common language of Palestine in the first century A.D. Jesus and his disciples spoke the Galilean dialect, which was distinguished from that of Jerusalem (Matt. 26:73)." ^ Metropolitan Bishoy, "The Assyrian Churches"
^ Donabed, Sargon (2015). Reforging a Forgotten History: Iraq and the Assyrians in the Twentieth Century. Edinburgh University Press. p. 18. ISBN 978-0-7486-8605-6. Baum, Wilhelm; Winkler, Dietmar W. (2003). The Church of the East: A Concise History. London-New York: Routledge-Curzon. Brock, Sebastian P. (1992). Studies in Syriac Christianity: History, Literature, and Theology. Aldershot: Variorum. Brock, Sebastian P. (1996). Syriac Studies: A Classified Bibliography, 1960-1990. Kaslik: Parole de l'Orient. Brock, Sebastian P. (1997). A Brief Outline of Syriac Literature. Kottayam: St. Ephrem Ecumenical Research Institute. Brock, Sebastian P. (2006). Fire from Heaven: Studies in Syriac Theology and Liturgy. Aldershot: Ashgate. Chabot, Jean-Baptiste (1902). Synodicon orientale ou recueil de synodes nestoriens (PDF). Paris: Imprimerie Nationale. Meyendorff, John (1989). Imperial unity and Christian divisions: The Church 450–680 A.D. The Church in historyb. 2. Crestwood, NY: St. Vladimir's Seminary Press. Seleznyov, Nikolai N. (2010). "Nestorius of Constantinople: Condemnation, Suppression, Veneration: With special reference to the role of his name in East-Syriac Christianity". Journal of Eastern Christian Studies. 62 (3–4): 165–190.